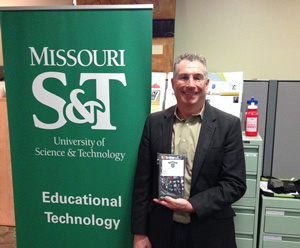 Congratulations to Dr. F. Scott Miller, Teaching Professor of Materials Science and Engineering, for winning a Kindle Fire HD6 for attending EdTech U in Fall 2014! Dr. Miller has been a regular customer of EdTech U and of EdTech services in general for the past several semesters. EdTech U will continue in Spring 2015, with more opportunities to win a grand prize at the end of the semester! We hope to see you there! EdTech U is currently open on Thursdays during the semester (when school is in session, excluding holidays such as St. Pat’s and Thanksgiving) in Centennial Hall Room 102 from 2 – 4 p.m. Hours may be subject to change, so stay tuned the eConnection for updates!